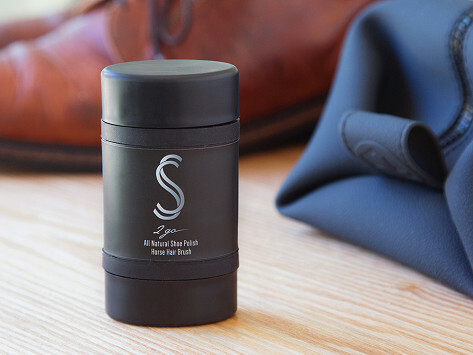 All the goodness of an old-fashioned shoeshine kit made compact and convenient. It includes two tubes of high-quality shoe polish sticks and a real horsehair brush to buff. The design is small enough to fit into your glove box, bathroom drawer, briefcase, or suitcase (TSA approved). Besides being so convenient that you’ll actually spiff up your shoes, the polish is clear to work on any color leather. Dimensions: 6.75" x 2.9" x 1.25"
This will be great for anyone traveling. Easy to use. The polish and brush in one package was just right. Several of us at The Grommet admit we hadn’t shined our shoes in forever. Then we tried 2GoBrand. It was so convenient, we were hooked. 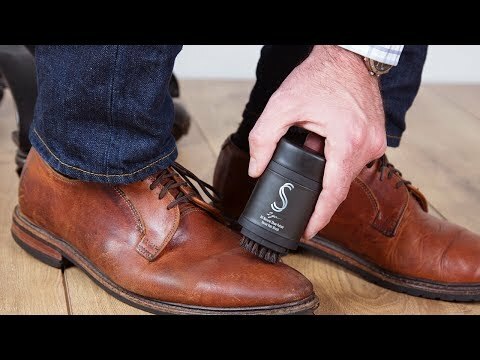 This portable shoeshine kit is Made in the USA and easy to have on hand, unlike the polish bottles and kits you’re probably used to. Inside the compact case are two high-quality shoe polish sticks, which are clear to work on whatever color leather you need to freshen up. A real horsehair brush is included, too, to buff. Small enough to fit into your glove compartment, bathroom drawer, briefcase, or suitcase, the entire thing is TSA approved. Besides donning scuff-free, shining shoes, you’ll feel good supporting a company that produces here in America.